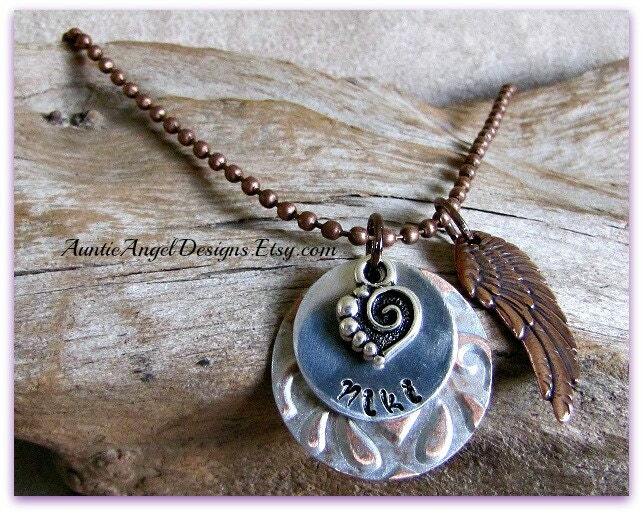 For moms and moms of those in fur, whether on earth or at the Rainbow Bridge, a stunning hand-stamped mixed metals necklace that you will be so proud to wear. 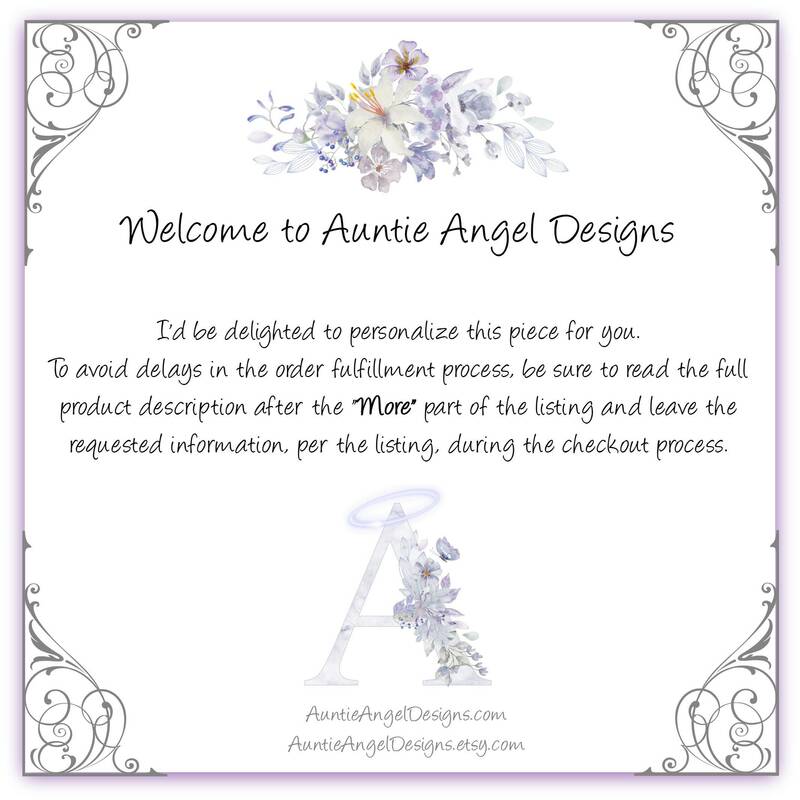 Your necklace will feature a 3/4" aluminum disc with your pet's -- or human's -- name lovingly hand-stamped at the bottom. This disc rests over an independent handmade and hand-painted silver-patinaed pure copper embossed disc which has been sealed to protect the color. The embossing/debossing appears on both sides of the larger disc, which is 25.5 mm in diameter, slightly larger than the size of a quarter. 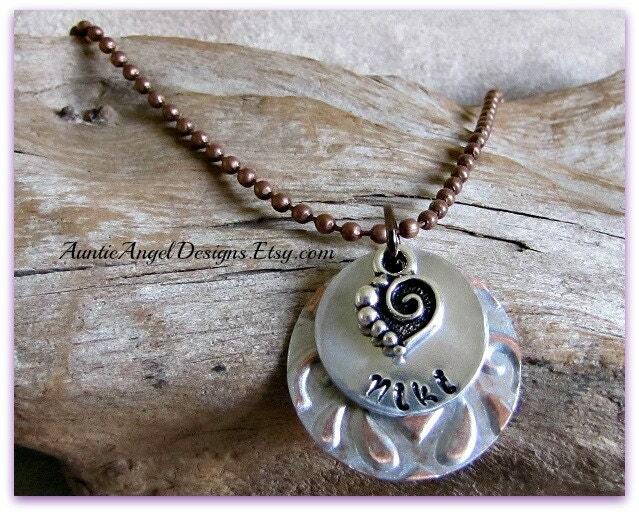 Note: Each embossed disc pattern will vary from necklace to necklace. As each name disc is stamped one letter at a time by me, know that the name may not be stamped perfectly as if engraved by a machine. Slight differences in orientation and spacing may, and most probably will, occur from piece to piece, which will only add to the character of the piece. A super-cute two-sided pewter spiral heart charm adds to the beauty of this meaningful remembrance necklace, which is finished with an antiqued 2.4 mm copper ball chain which is 23" inches in length. You may easily clip the chain to make the necklace your desired length. 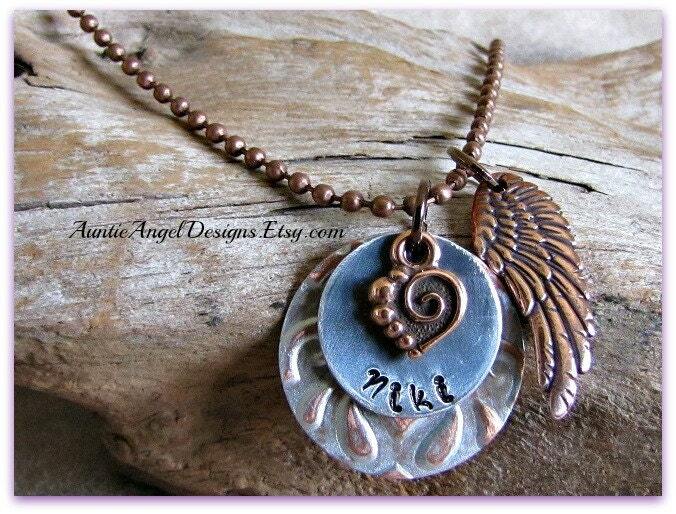 To further personalize your necklace and for a slight upcharge, choose the copper swirl heart charm (INSTEAD OF the pewter swirl heart charm) and the copper two-sided angel wing charm. If no instructions are given to me, you will receive the ensemble shown in the first photograph, which is the aluminum disc, the embossed larger disc, the pewter swirl heart charm, and antiqued copper ball chain. 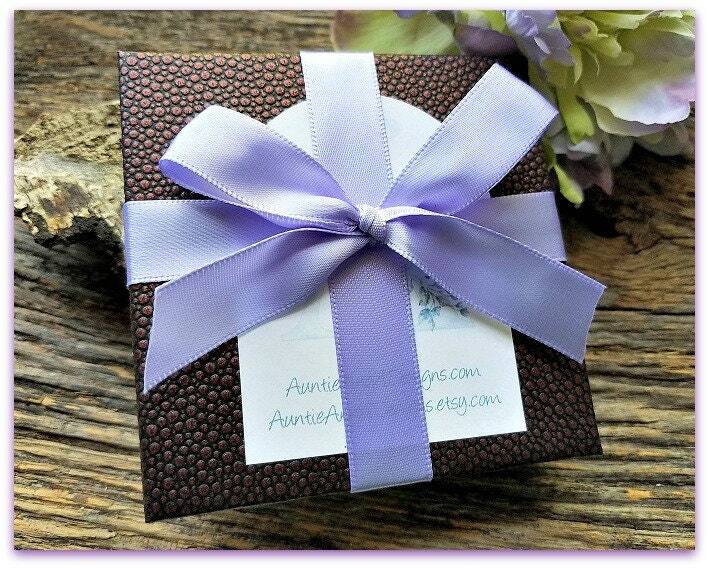 This hand-stamped necklace is beautifully gift-boxed and ready for gift giving.